Announcement Welcome to my shop, formerly called, Darlin Girl Creations, now known as Needle Felt Art by Cherie'. 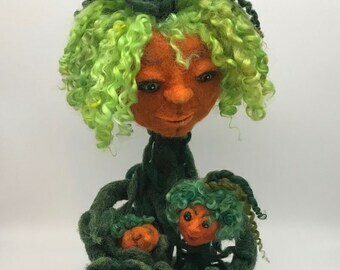 I'm excited to be expanding my line of sculptural needle felted art dolls and characters, and now include OOAK wool art "paintings" suitable for framing. Thank you very much for your interest and support! 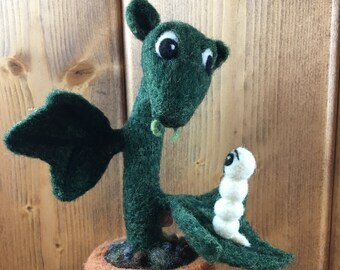 Welcome to my shop, formerly called, Darlin Girl Creations, now known as Needle Felt Art by Cherie'. 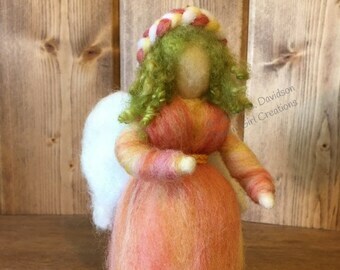 I'm excited to be expanding my line of sculptural needle felted art dolls and characters, and now include OOAK wool art "paintings" suitable for framing. Thank you very much for your interest and support! Moon man is so cute. His not so perfect teeth make him such a lovable guy! Shipped quickly and beautifully gift boxed. The detail and craftsmanship on this lamb is remarkable. I'll treasure this ornament forever! Thank you, Cherie! The Monster is absolutely beautiful and so well made. He is even better than the photographs of him. There was incredible detail that did not show up in the photos. These were details around the top of his head that could only really be seen when The Monster was in my hands. Cherie is such a true artist and puts so much thought and care into everything she makes. Everything she creates is high quality and is worth every penny! I am starting to lose count, but I do believe that this is the sixth item that Cherie has made for me. She is great to work with. Sometimes it takes awhile, but I know Cherie is making an incredible doll and that it will be worth the wait. The Monster was definitely worth the wait. He was packaged well and shipped quickly when he was completed. Can't wait for Vampira now!! Hello! I am so excited to have you stop by my shop! I hope you'll enjoy finding something you can't live without! Or, if you're just browsing, I'd LOVE to hear what you think about my custom creations. Above all, my goal is to create smiles and provide original, handmade, one-of-a-kind items that you can proudly own or give as a gifts that will never be duplicated and hopefully will help spread some smiles, too. Thank you for visiting, and for supporting small businesses and handcraft artisans! Please come back soon...and tell friends about Darlin Girl Creations! I have a great, no-hassle refund policy for shop and non-custom items! If you aren't satisfied with a non-custom item, return it to me and you get your money back. Simple, honest, no worries. I want you to love your purchase! And smile when you visit my shop. So, please contact me immediately if you receive your item and it is damaged or you are dissatisfied with the product in any way, so I can make it right according to the situation. If you must return an item, upon my receipt of it, I will issue you a full refund (less shipping...but if it's my error, I will also refund your shipping!). My goal is to make every transaction 100% satisfactory! All I ask is that you write me personally with any problem or issues so that I can take care of it right away for you! Payments can be made via credit card, Etsy gift card and PayPal. Purchased items will typically be shipped the following Friday after payment has cleared (which is usually immediate, unless you have a new PayPal account). Taxes will be added automatically by Etsy, if applicable for you. Since I am based in Washington State, taxes will be applied for anyone ordering from Washington (according to state and local laws). I generally ship on Fridays, but whenever possible, I like to try to mail things out within a couple days of payment -- but for non-custom, ready to ship items, you can always count on the Friday following your paid order, at the latest. CUSTOM ORDERS: Custom orders of $100 or more include a built in 50% deposit. CUSTOM ORDER CANCELLATIONS & REFUND POLICY: If you choose to cancel the order within 24 hours of purchase (before I have started production), you will receive a full refund of the purchase price (generally credited back to your account through Etsy payment within 48 hours, except for holidays or non-banking days). For cancellation after 24 hours, and I have started your order, I will refund 1/2 your purchase price only (the 50% deposit is non-refundable after 24 hours after purchase); however, the deposit can be credited toward a purchase in my shop if used within 30 days. A fully completed and ready-to-send custom order that is cancelled after completion will be refunded half the purchase amount, with no refund of the deposit amount, and no sales credit given. This is to help recover used materials and lost labor. IMPORTANT: Please note: If you must cancel a custom order at any time in the process, please let me know and we can work out an arrangement depending on your circumstances. I want you to feel secure when ordering custom work from me! COMPLETION TIMES FOR CUSTOM ORDERS: Demand for my work is increasing, and due to the nature of customized sculptures, please allow 4-6 weeks for the completion of custom dolls from the time it is scheduled to begin. Smaller pieces usually can be completed in 2-4 weeks, depending on how many are in my work queue at the time you order. Because I also hand make the gift box for each item, it will be very much worth the wait! However, I am very good at keeping clients updated on the progress of their pieces, and will not only keep you updated on your creation's progress, but I also love sharing progress photos with you, anytime, and as often as you'd like. Please write with any questions you may have! Thanks to Etsy's new shipping options, you can now choose from a variety of USPS shipping methods that best suit your needs. NOTE: I am very willing to expedite shipping if you need it overnight or by a gift-giving deadline. If you wish any custom delivery arrangements other than the options available at checkout, please email me before making payment. SHIPPING DATES: Currently, ready-to-ship orders are mailed out every Friday. INTERNATIONAL SHIPPING: I am now very happy to ship most items internationally. For the rare items that do not show an International option, please ask for a postage price quote for your location outside the U.S., and I'll let you know what the cost would be before you place your order. Please write before payment of your order if you have any questions or would like alternate shipping options. Thank you! WORK ROOM CONDITIONS: All items are created in my studio, which is a smoke-free environment. 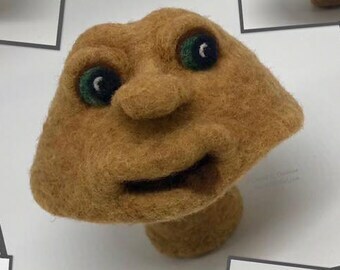 There is an abundance of natural wool in the work studio and shipping areas, so be advised if you are allergic to wool. Also, there is one short-haired dog (my sweet girl, Dixie-Doo) who sleeps under my work table most the time. Because of this, I take great pains to keep the studio clean and as dust-free as possible...which includes storing completed items inside closed plastic bins until ready for shipping. TEXTILE, FABRIC & FIBER TREATMENTS: All fabrics are prewashed before assembly. I only use a natural, organic, non-scented soap (coconut oil-based soap from Tropical Traditions), and I color set dark and bright colors naturally with vinegar when needed, to set colors to help prevent them from running or bleeding when washed at home. Wool and all animal fibers are generally washed by the people I purchase them from. However, I only source wool and fibers that are cleaned naturally, without chemicals or acids, from humane handlers. Any exceptions, if any, will be noted in individual item descriptions. UPDATE (Spring 2016): I have begun sourcing my own natural raw wools, and washing them myself with natural, non-toxic Unicorn products, which are plant-based, very lightly scented with lavender (and other) essential oils, and completely planet-friendly. This is all to further my goal of a completely clean, eco-friendly and "old world" aesthetic in my handmade creations. 100% SATISFACTION GUARANTEED: I invite you to write me anytime with your comments and feedback, thoughts or requests. I greatly appreciate feedback for my work and your experience, and, as stated in my refund policy, I will do everything possible to be sure you are happy with your purchase! To fulfil your order, you must provide me with certain information (which you authorized Etsy to provide to me), such as your name, email address, postal address, payment information, and the details of the product that you’re ordering. You may also choose to provide me with additional personal information (for a custom art doll order, for example), if you contact me directly. -- Service providers. I engage certain trusted third parties to perform functions and provide services to my shop, such as delivery companies. I will share your personal information with these third parties, but only to the extent necessary to perform these services. -- Business transfers. If I sell or merge my business, I may disclose your information as part of that transaction, only to the extent permitted by law. --Compliance with laws. I may collect, use, retain, and share your information if I have a good faith belief that it is reasonably necessary to: (a) respond to legal process or to government requests; (b) enforce my agreements, terms and policies; (c) prevent, investigate, and address fraud and other illegal activity, security, or technical issues; or (d) protect the rights, property, and safety of my customers, or others. I may store and process your information through third-party hosting services in the US and other jurisdictions. As a result, I may transfer your personal information to a jurisdiction with different data protection and government surveillance laws than your jurisdiction. If I am deemed to transfer information about you outside of the EU, I rely on the privacy and security of GoDaddy and/or MailChimp as the legal basis for the transfer. -- Access. You may have the right to access and receive a copy of the personal information I hold about you by contacting me using the contact information below. -- Change, restrict, delete. You may also have rights to change, restrict my use of, or delete your personal information. Absent exceptional circumstances (like where I am required to store data for legal reasons) I will generally delete your personal information upon request. -- Object. You can object to (i) my processing of some of your information based on my legitimate interests and (ii) receiving marketing messages from me after providing your express consent to receive them. In such cases, I will delete your personal information unless I have compelling and legitimate grounds to continue using that information or if it is needed for legal reasons. -- Complain. If you reside in the EU and wish to raise a concern about my use of your information (and without prejudice to any other rights you may have), you have the right to do so with your local data protection authority. *If you need to access, correct or delete personal information held by Etsy, you will need to send a request directly to Etsy. Every piece comes wrapped in tissue paper. Most items will be mailed in a sturdy cardboard shipping box to help ensure against damage in transit. Smaller items may be wrapped extra heavy for protection and mailed in a gray/silver poly mailer. I've found there are two schools on this. Some prefer vacuuming, and others prefer blowing off the dust. To vacuum, put a thin sock, nylon or something similar over the vacuum hose (use a drapery setting if you have one, if not, just keep the hose from making direct contact). This works well without disturbing the fibers much. Some collectors prefer using those little keyboard vacuums because they are less powerful, and safer for your collectible. To blow dust off, many like canned air (like the ones used for cleaning computers). My favorite choice is a manual air blower for cleaning camera lenses. I use a Rocket Air Blaster, a manual "puffer" that easily shoots out quick bursts of air. I use mine all the time.